Mesolithic Deeside is a group of archaeologists, students and local volunteers investigating the river Dee area 10,000 years ago. The river Dee is in Aberdeenshire in NE Scotland. 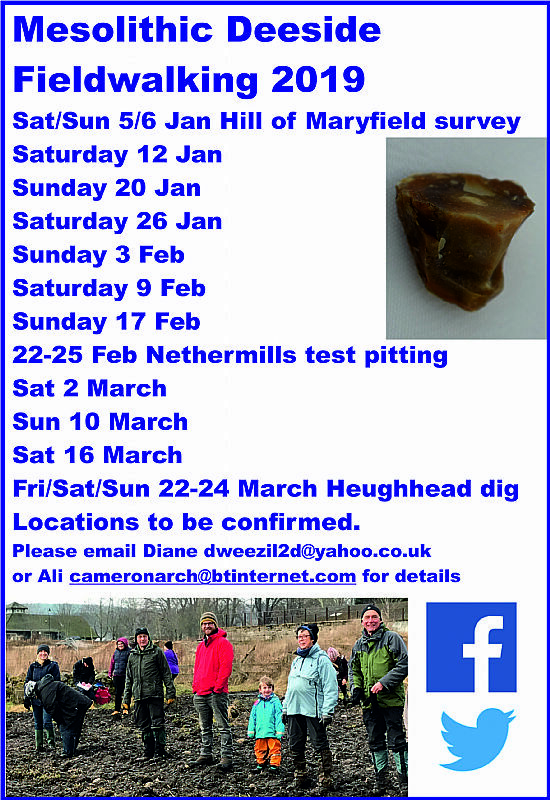 Ancient Deeside is a Heritage Lottery Fund, Stories, Stones and Stones project fieldwalking and analysing flints from the River Dee area. Mesolithic Deeside has received a Heritage Lottery Fund (HLF) Stories, Stones and Bones grant. 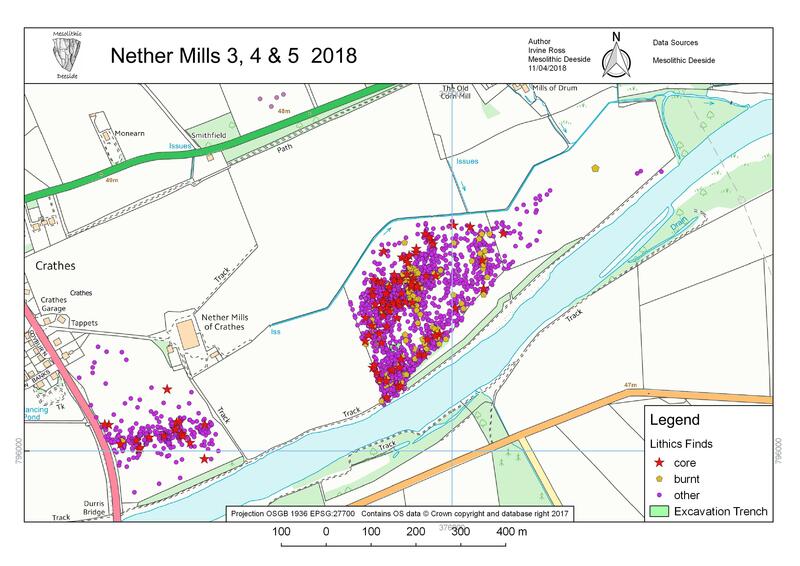 This exciting project, Ancient Deeside has been given £10,000 to enable the group to extend fieldwalking along land bordering the the River Dee, to analyse the flints collected and cascade information from the finds to local people. This project is part of Scotland’s Year of History, Heritage and Archaeology. This pilot project, Ancient Deeside, part of the wider Mesolithic Deeside group,focuses on the Mesolithic period, 8000-4000BC, immediately after the last Ice Age. The inhabitants of Scotland at the time comprised mobile groups of hunter-fishers who left little trace of their passing so that the archaeological evidence is formed mainly of stone tools of flaked flint. The River Dee, in Aberdeenshire, runs from the mountains and glens of the Cairngorms to the coast at Aberdeen. Ancient stone tools found along its length attest to 10,000 years of human settlement from the earliest hunter-fishers of Scotland onwards. Archaeological work has involved academic research as well as community-led fieldwalking, but there has been no systematic study to combine information into an overview of the early activity along the river. 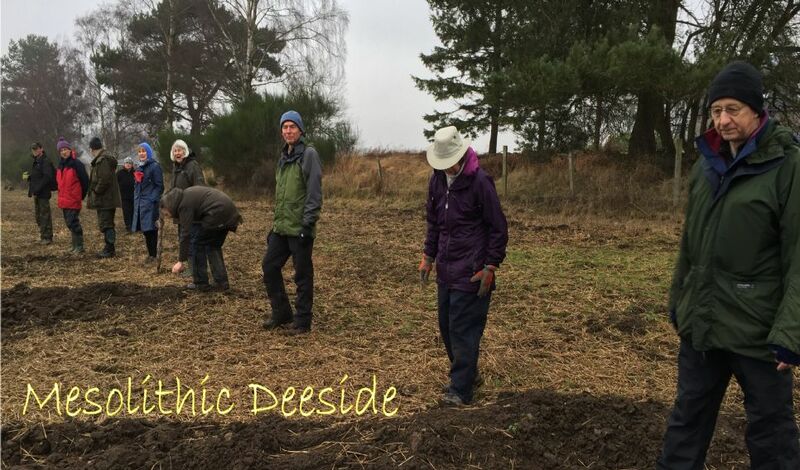 The Ancient Deeside Project aims to combine the study of known Mesolithic material with new material obtained from fieldwalking, thereby adding to our understanding of the period. The project will involve volunteers including local people, students and schoolchildren. The aim is to train participants in fieldwalking, finds analysis, recording, photography, archaeological cataloguing, the Mesolithic period and archaeology in general. We are hoping to involve local primary and secondary schools and will host open events to pass on our findings to the wider community. 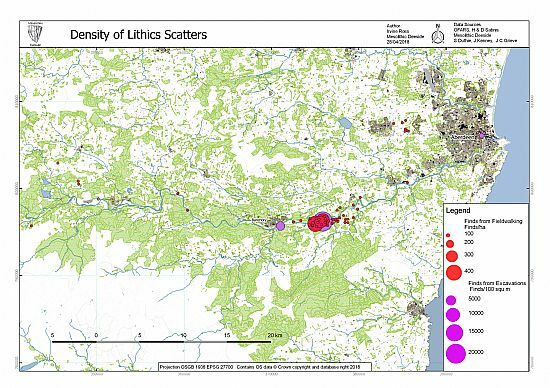 The Lithics page contains is an initial report on the flint and other stone finds and the information will be fed into the mapping to allow the locations of Mesolithic finds to be plotted. We will then be sourcing funding to test pit at these locations to determine if structural remains survive.